Please hop along with us! You have a chance to win one of the above stamp sets! Just comment on the following blogs (don't forget this one), each day for more chances to win! (You do NOT have to comment on all the blogs each day! The names are drawn randomly!) All four winners will be announced on July 21, 2012 on the Mark's Finest Papers blog. You can go back and comment if you missed a day. (HINT: The more you comment, the more chances you have to win and comments on the MFP blog count twice!) The deadline for commenting is 11PM EST on Friday July 20, 2012. The last day of our blog hog - wah! Isn't this a really fun set? Remember, you don't have to leave a comment on every card or project, but the more comments you leave - the more chances you have of winning. 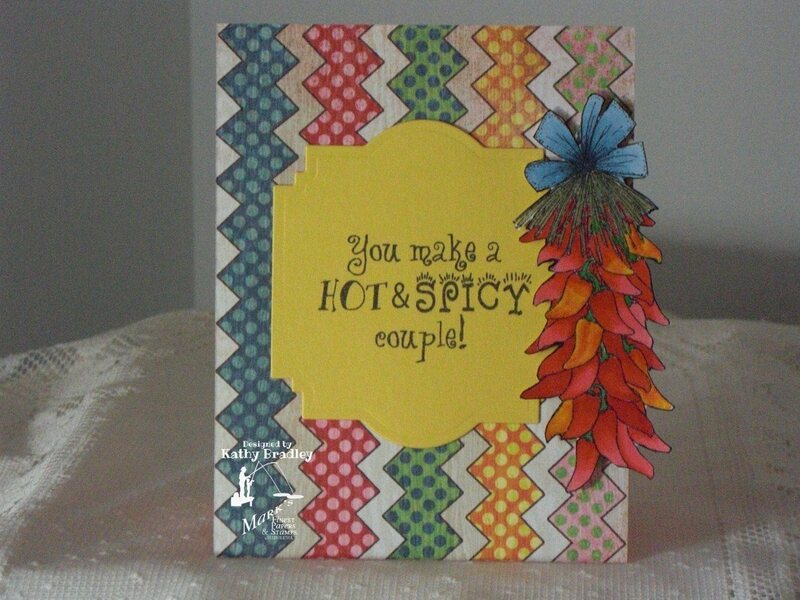 Stamp: Hot & Spicy by Mark's Finest Papers, a Heinrich Co. Thanks so much for stopping by - and the winners will be announced on July 21st on MFP's blog. Your next stop is Brenda's blog! Kathy, I love that colorful zig zag background...just perfect for these peppers. You did a super job coloring them. Awesome card! Love the zig zag stripes fro te background. Such great colors in your card. You are so talented. A very cute card. I like the awesome colors and the hot and spicy sentiment. Great coloring. LOVE those zig zag stripes! They look great behind your chili peppers. Fabulous! 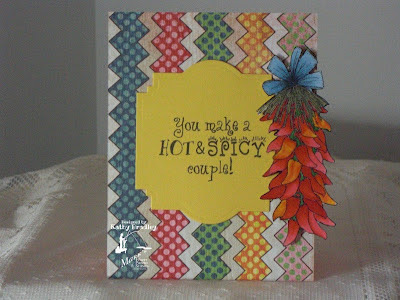 What a great card for a hot, happy couple! Like the paper piecing & coloring. Your card is HOT looking indeed. These make me think of Tex Mex food. Cute card. Love the rick rack background and the popped up chili peppers. Color combo is great. Thank you. Love that background against the peppers. Shows them off quite nicely. Zig zags AND polka dots! Love the background! What a HOT, colorful card, Kathy! An electrifying card! 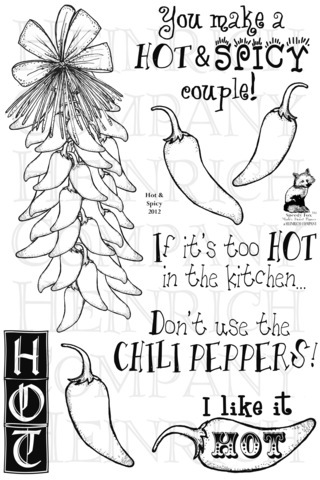 I love it and especially the coloring and placement of the chilis. I've enjoyed the hop and seeing everyone's take on these stamp sets. Thank you. Really cute! I love the paper you used to back up your sentiment too! Love your card! Great coloring! I love the zig zags. Like the peppers hanging off to the side like that! Those zig-zags are great. Your whole coloring concept is just beautiful Kathy - I love the peppers too! Cute set Kathy. What a fun card.